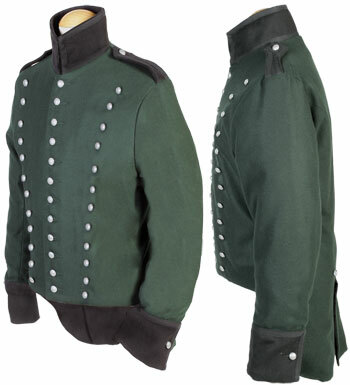 This our 'standard' version of the 95th Officers tunic, made from Rifle Green wool with black velvet collar and cuffs, the example illustrated is the one we make for the majority of our Re-enactor clients. All the lace is black russia wool lace as per original. Please note this item is not held in stock and will be made to order in about 12-14 weeks depending on how busy we are! Shown is a generic Pelise circa 1790 - 1815, these are collectors quality garment made in military grade wool with silver russia lace. Any uniform of this type can be made for you (just send us the picture of the uniform you require) but they are to special order only and because they are hand made delivery is approximately 12 - 14 weeks subject to our workload. Please note prices may vary if the cuff lace design is more complicated, however we will always quote you before proceeding. who is also a well know Military Artist. Please contact us if you would like something similar. 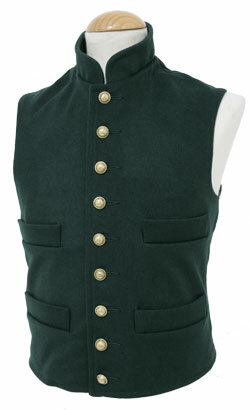 Made from rifle green wool with black facings and finished with 1/2" pewter buttons, fully lined in black cotton. We make a lot of these for re-enactors all over the world. 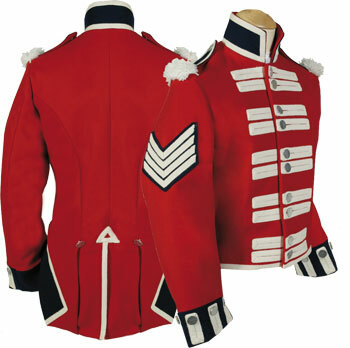 We were proud to be asked to produce the uniform and accoutrements for 2 brothers to honour the memory of their, great great great grandfather who served in the 57th Middlesex Regiment and fought at the battle of Albuferra in 1811. 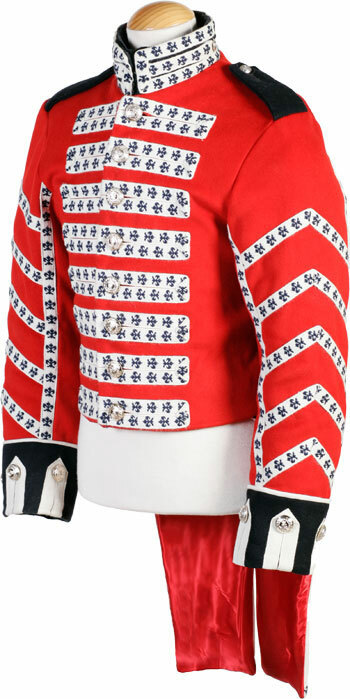 Please inform us of regimental lace when ordering. 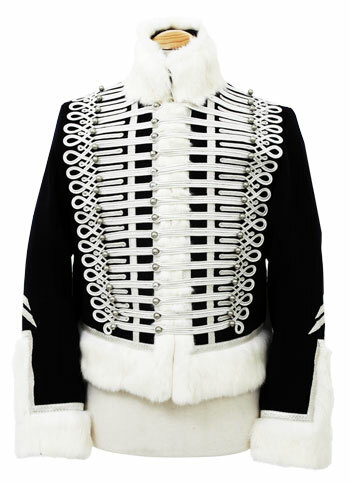 This is the Waterloo period Coattee for the 60th Rifles, this one was made for The Royal Greenjackets Regimental Museum but we also make many of these for re-enactors and collectors all over the world. Fabulous quality, made from military weight wools, fully lined. Delivery 12-14 weeks. Pewter buttons are fitted. Made in dark blue wool with jamaica yellow tape & pewter buttons. This version was made for one of our clients & the rear lace design is to his own specification. Made in dark blue wool with scarlet facings to cuff and collar, Jamaica jellow box piping to front and the rear to regulation pattern. Brass buttons are fitted. 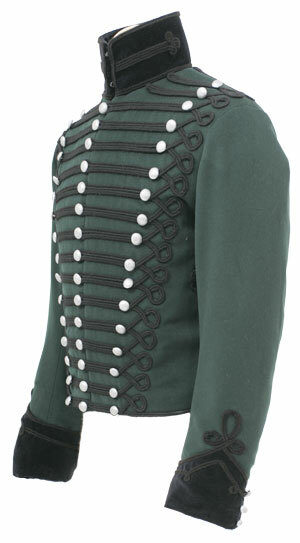 Made from rifle green wool with black facings & fitted with 1/2" pewter buttons, fully lined in black cotton. We make a lot of these for re-enactors all over the world. 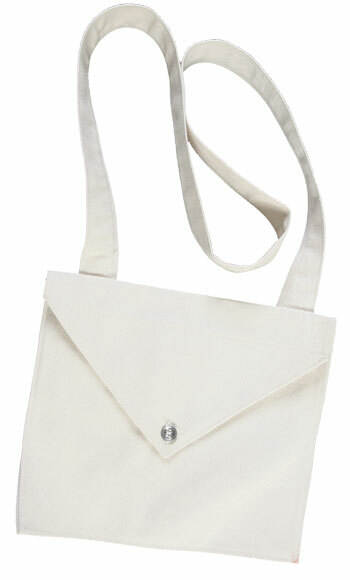 Confederate white canvas pattern haversack, with button flap. 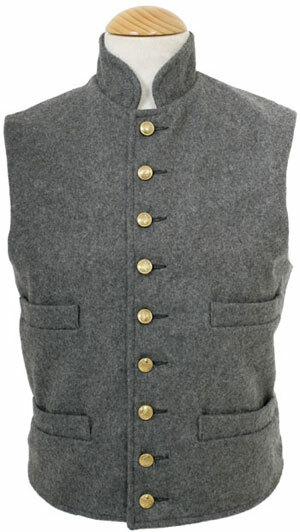 US pattern canvas haversack, circa 1860, with two button flap. These were made for clients who re-enact the Light Company of Loyal Newport Volunteers. Made from a top quality Hainsworth wool, the clients supplied their own buttons and epaulettes and the price does not include these items. 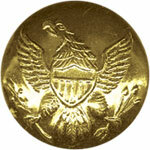 We cannot easily obtain individual regimental buttons so we fit a generic brass or pewter button as standard. Period 'Housewife' includes period pack of needles and some buttons, hand made in period cloths, no two the same. Made by us, so you know they're good ! 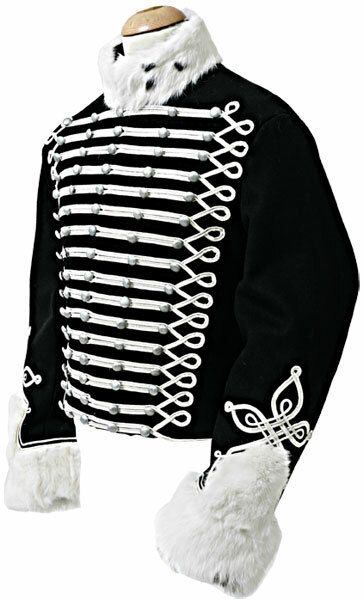 C.1815, this jacket was made for a discerning Napoleonic Re-enactor, it is made from best military scarlet wool & trimmed in gold mylar hercules lace. Please note our customer supplied his own buttons, we do not have a regular supplier for these regimental Napoleonic buttons, if you do not have your own buttons we will fit plain brass buttons in the appropriate sizes. The tunic is supplied with the Sergeants chevrons but not the Crossed flag insignia that is illustrated. 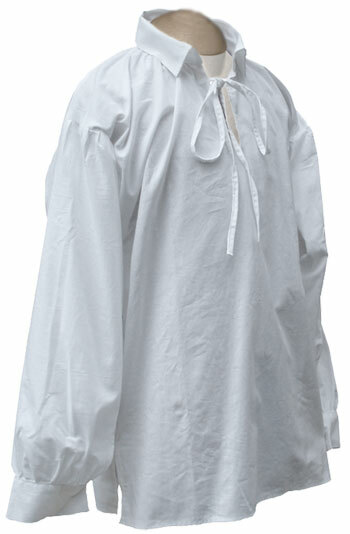 Shown here is our superb quality French Line Infantry tunic c.1810, made from best military grade wools & fitted with plain brass flat buttons, fully lined, white stitching is used in the appropriate places as per original examples. 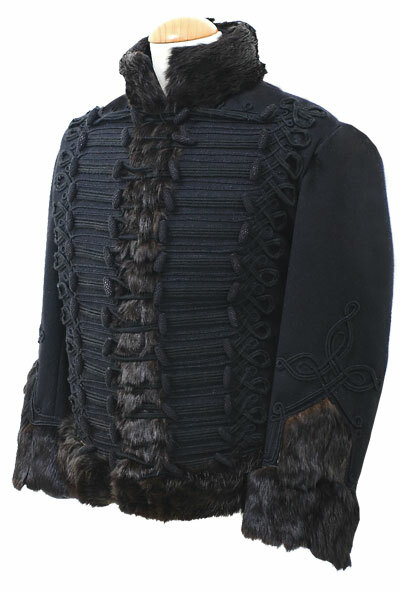 Created for one of our clients to his specification this Prussian Pelise is circa 1815, this is a collectors quality garment made in military grade wool with silver russia lace and real fur. We have been asked to make this item available to order on line, so now you can! Any uniform of this type can be made for you (just send us the picture of the uniform you require) but they are to special order only and because they are hand made delivery is approximately 14-16 weeks subject to our workload. Please note prices may vary if the cuff lace design is more complicated, however we will always quote you before proceeding. A faithful copy of the Regimental Pelisse made in best dark blue military grade wool with black russia lace and black wool covered bosses. The fur is bought in especially for this item it is a long, very fine goat hair that is very similiar to the original fur used (frankly it is as close as you can get nowadays). The back of the pelisse has russia lace in the correct pattern also. 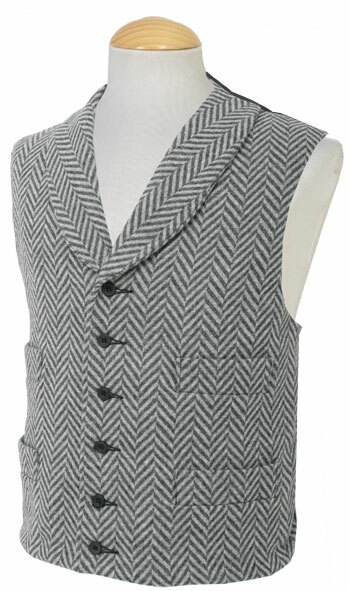 Made to order only minimum12 weeks delivery, other styles availble, please ask for details. 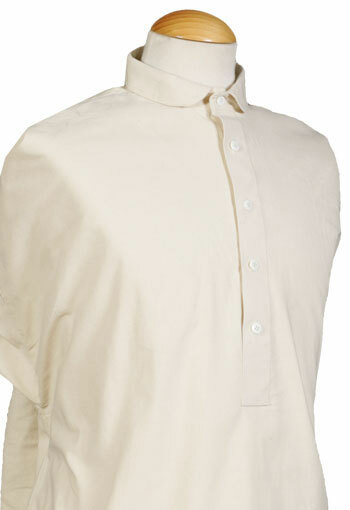 Made from 100% quality cotton, this frill necked shirt has eyelets around the neck opening which allow the shirt to be drawn closed. 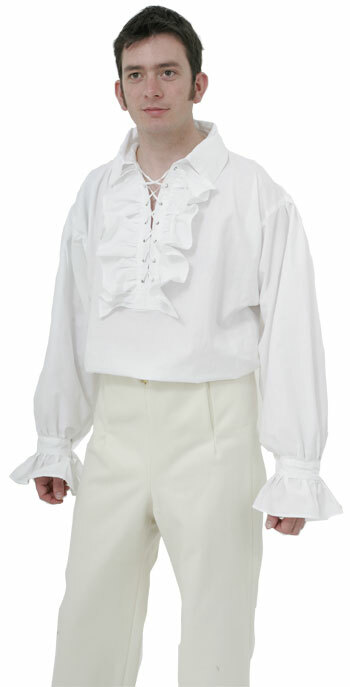 The cuffs have a 4 inch frill as well and are closed with pearl buttons, an excellent gentleman's shirt. 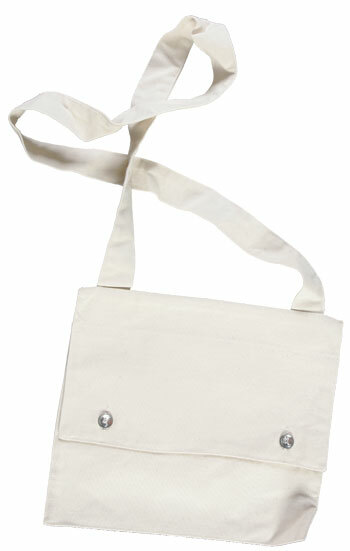 Please note this item is not held in stock and will be made to order in about 10-12 weeks depending on how busy we are! 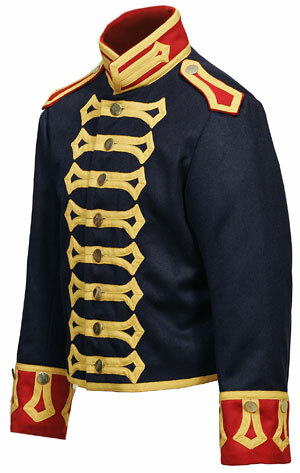 Napoleonic period fall front trousers, one of the 'standard' military trousers of the time made in military grade wool. Ideal for British regiments. Correct period trousers with proper leather cuffs, made from Hainsworth grey wool with red stripe. 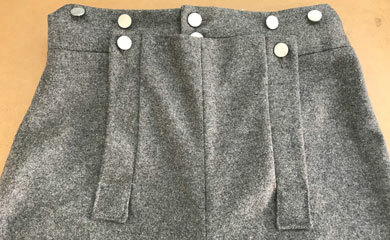 Our very best Regency/Napoleonic Gentleman's trousers, made in plain coloured wool. New for 2018, a new style of flap - with side tabs and a waistband, which makes them more period correct. 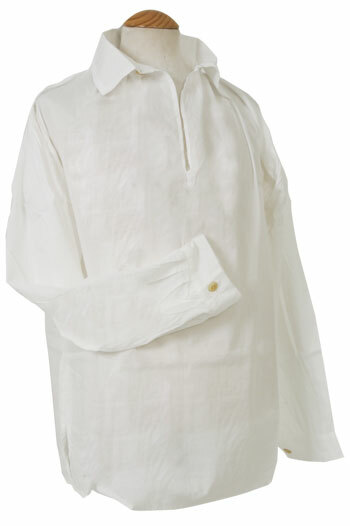 We make these from a period appropriate heavy duty cotton duck, now available in white or natural/off white colour. Made either as a 'Fall Front' or as a 'Traditional' button up fly, it is your choice. 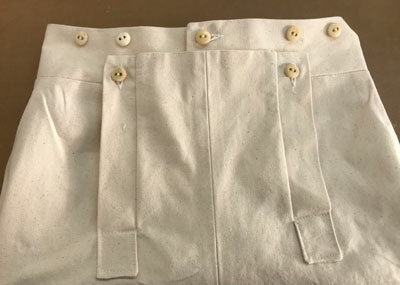 We make these from a period appropriate heavy duty cotton duck in an off white colour, they are made with a split cuff as shown. Napoleonic 'fall front' Officers trousers, made in either grey or dark green wool with 'zigzag style' brown leather inserts as shown. Supplied with flat pewter buttons. Please note these trousers are cut tight to the leg as they were during the period. 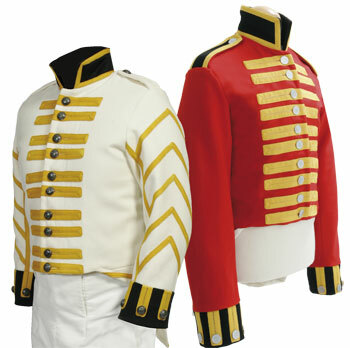 Collectors Quality only made from finest Hainsworth wools with cotton linings where appropriate, example illustrated is one of a large number we made for the Gibraltar Tourist Board and has silver lace bastions, any regimental requirements can be altered to suit your own specification. in time to coincide with the anniversary of the Massacre of Clencoe 1692. 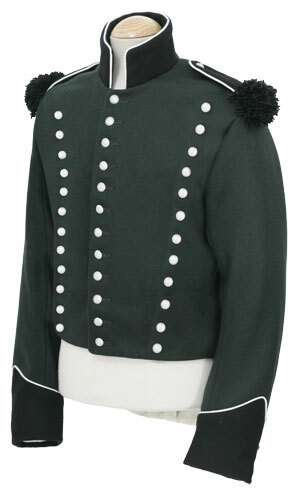 Along with a great number of naval uniforms we also made a wide range of army reimental uniforms. these ones went to Norfork. where as the Gibralter uniform was blue with silver lace. We can produce any variation. Please contact us for your requirements. 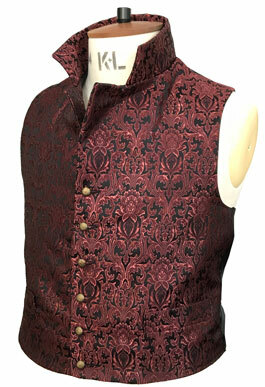 Shown here is an example of a Musician's Coatee that we make quite a number of each year for a group here in the UK. 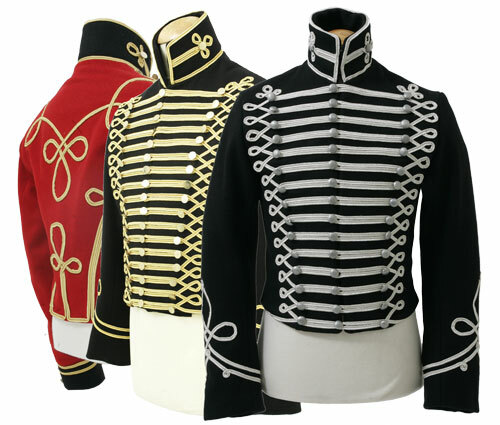 We are pleased to quote you for any style of musician's uniform please contact us with an image of the uniform you would like making.